A trading system is basically a set of rules. The main trouble with trading is that we are all talking about something which does not have a definitive answer, ie there is no holy grail system, it’s much more about adapting a high probability trading plan that suits your personality. It’s a problem for each of us to be able to define where we sit comfortable with a ‘giving back to the market’ period. A trader’s trading system settings might be right for him/her but that might not be right for you or me. That’s the reason I’m against following others and using someone else’s trading settings/signals. For instance, I can think you can realistically say that momentum trading or trend following is profitable but each of us needs to find an individual exit strategy that fits our emotional well-being. 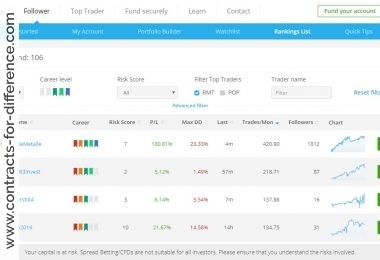 Different traders also have different capital bases/incomes so the degree of risk and acceptable drawdown can vary enormously between traders even if they are trading the same identical system. For this reason, trading systems are very much personal things, what suits one trader probably wouldn’t suit another and their tolerance to pain i.e. seeing their trading capital shrink as the price moves against them. So again getting back to our trader – what might work for him might not be right for anyone else, which doesn’t our trader right or wrong. I would rather suggest that the ultimate journey of becoming a trader is finding your own thing. Professional traders have recognised and accepted this fact, which can then help accelerate the route to trading success. Additionally no one system is right or wrong, so stick to what makes you money. I would advise you to work hard on building a single trading method that is effective and suitable for you before trying or jumping to a new one. Personally I subscribe to the KISS principle, I’ve tried all the complicated methods and just lost my way so I just keep it simple now….Simple trading systems usually work better than complex ones as they have less elements that could go wrong and this has always been so for everything. For this reason a simple system is simply more robust as it has fewer parameters which can break so always keep this in mind. I’ll tell going to describe two trading systems I use, I’m not recommending the following as suitable methods though, they just happen to work for me. Trading a profitable trading system is one of the most important factors in making an overall profit. All stock market traders will have both winning and losing trades. Don’t seek the perfect trading method that will always be correct because it doesn’t exist – instead you would do better to focus on keeping your losses small and your methods consistent. It is likely that when you start out trading CFDs you will experience some losing trades. 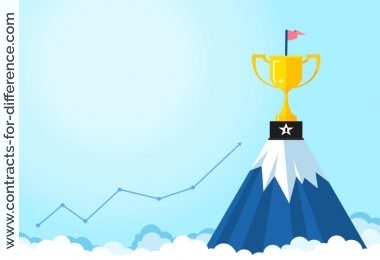 However, even if the number of losing trades can be more than the number of winning trades, the size of the winners is what makes the difference. In order to make consistent long term profits, you need to properly back test and understand your trading system. All trading systems are built around probability and positive expectancy. I have been trading for many years and have just had my worst run of losing trades in a row (9). But it does not bother me at all, I mean I’m not doing cartwheels or anything but I know it’s within an accepted range of probability. And I’m also not complaining too much because a few weeks earlier I had my longest run of winners in a row (14). The reality of investment markets means that even the most educated predictions can prove wrong, especially in the short term. 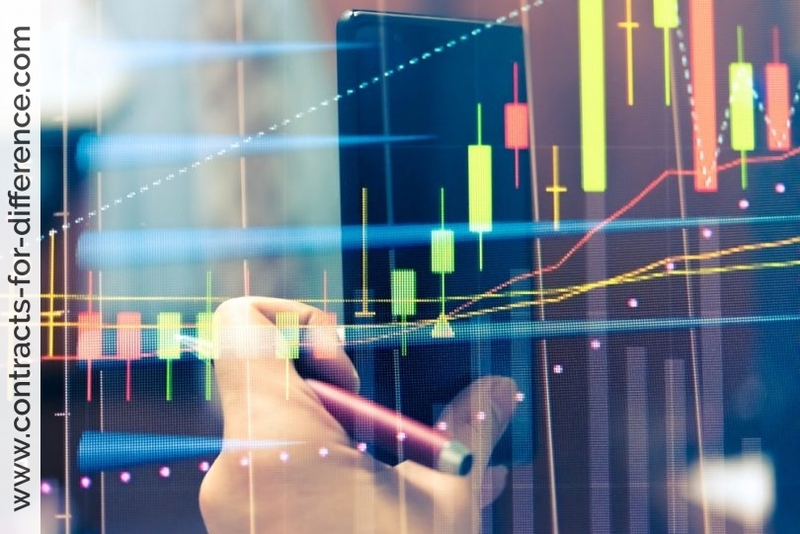 Unexpected new information, changes in market conditions, changes in government policy and many other unpredictable events can result in quick changes in market value. Trading is about consistently applying a positive expectancy (your edge that your system provides) over a period of time long enough to achieve it. Define the trading strategy you will use. How long do you intend to hold a share? How much time do you have for trading? 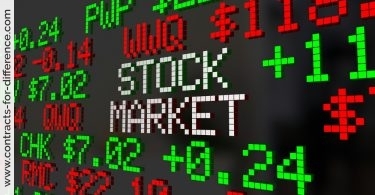 What criteria will you use for buying or selling a share? 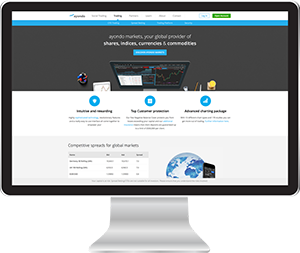 Write out your plan – Treat trading as a business. Write down your plan detailing how you will operate your business. Determine market direction. What’s your method for determining market direction? The risk management rules. Decide on the trade size. Detail and limit number of trades and trade amounts. Incubation. All trades should be linked to a stop loss. Your trade is most at risk at the beginning of the hold (since the stop loss is nearest). How long to hold a share if it’s not performing? Know when to exit a trade. Know when to add to a trade. Track and document your trades. 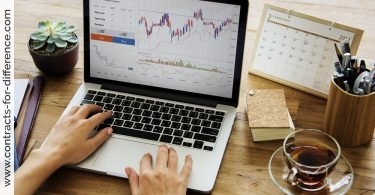 Measure the performance of your stock market trading system, you need to look at its profits as a percentage of your initial cash float, the maximum historical drawdown as a percentage of your initial cash float, the steadiness of returns, and the profit-loss ratio combined with the win-loss ratio. For myself I take a relatively long term view on forex pairs and I use a very simple three moving average system based on a weekly chart. I use three exponential moving averages, the second being twice the value of the first and the third is twice the value of the second (i.e. 13, 26, 52). I wait until all three are lined up in the right order to indicate a good trend to hop onto. That means 13 above 26 and 26 above 52 for an uptrend and the other way around for a downtrend. Once on board I just hang in there until one of the exponential moving averages (EMA) lines crosses another, then I’m out. If the EMA lines are crisscrossing all over the place I just sit and wait. It’s just your basic trend following method and it’s quite dull boring stuff to be honest, since foreign exchange trends can last for years, but it works – in the long term anyway, in the short term it’ll drive you round the bend as the prices rocket upwards then nosedive so it’s best not to watch too closely, once a week is enough. Pullbacks to the EMA’s can be a good time to add to the position but I tend to not do that. For the indices I take a far shorter term view and I have adopted a relatively simple method that I have nicknamed the two bar swap. That just means that if you get two consecutive bars closing below their open, you consider a short or if you get two consecutive bars closing above their open you consider going long. To filter out the noise, I use a 26 period weekly EMA so I only take indicated trades that are supported by the direction of the EMA. If the EMA is flat, I do nothing. I trail a stop at the previous peak (the latest high for a short or the latest low for a long). If we get a swap in the opposite direction, I move the stop to the high or low of the bar which indicated the swap and trail it at the latest bar from then. Due to the shorter term nature of the beast, this is by no means as reliable as the method used for the currencies but the interest and excitement level is higher and I need something to keep me occupied! To make this easier to see, I wrote a simple script to colour the chart background green for a long or red for a short. 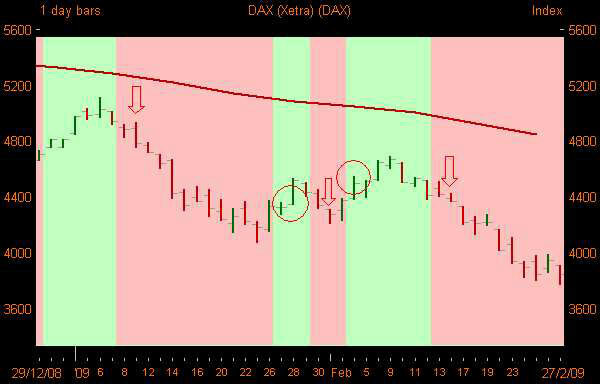 Below is an example chart using this method for the DAX index. I drew arrows on the chart to indicate the trade entry points while the circles indicate the associated exits. Focus on the trading setups, not the money. Losers think about how much they can win. Winners concentrate on how much they could lose. Focus on the trading setups and the profits will take care of themselves. Use of correct money management is the key to success. Without it, even the best trading system is destined to fail. Best to cut losses at a defined stop but if I miss the stop I get out as soon as possible and suffer the loss. What goes down can go down further. The other point to bear in mind is that if you have built a strategy it’s not worth a light if you sometimes ignore it. You might as well admit you have no strategy but are a discretionary trader doing a bit of this and a bit of that. There are many good profitable discretionary traders about so I’m not a strategy snob, its just that a disciplined strategy works for me. The real key to success with a trading system is money management. Capital preservation is paramount and this is something which many traders simply fail to appreciate how important this is. A system which loses 70% of the time can still be very profitable if losses are kept small and the 30% of winning trades cover the 70% of losers and more. British engineers heard about the gun and were eager to test it on the windshield of their new high speed trains. Arrangements were made. But when the gun was fired, the engineers stood shocked as the chicken hurtled out of the barrel, crashed into the shatterproof shield, smashed it to smithereens, crashed through the control console, snapped the engineer’s backrest in two and embedded itself in the back wall of the cabin.